Derek Yu's Spelunky made a name for itself as a freeware release years ago. Adapting concepts from roguelikes such as randomized levels and permanent death (lots and lots of permanent death), it uses a familiar 2D platformer base to offer gameplay that is both intrinsically enjoyable and always interesting. To be frank, Spelunky could have been halfheartedly released on Xbox Live Arcade with only the most basic of features included, and I would have likely adored it. Instead, this version adds a new soundtrack, a fresh art style, support for cooperative play, and a ridiculous deathmatch mode, among other things. It's as refreshing a game now as it was back then. In Spelunky, your goal is to navigate through what start out as rather traditional cave tunnels, collecting treasure and saving damsels in distress (or pugs -- seriously, there's an option for that) along the way. Of course, it wouldn't be a proper adventure without snakes, bats, spiders, arrow traps, spikes, and the like getting in your way. Technically, all you need to do is not die, but loot certainly won't hurt. Given the game's aforementioned influences, not dying is easier said than done. A brief tutorial will catch you up to speed with the basics, from how bombs and ropes work to your uncanny ability to pick up (and naturally throw) just about anything in the environment. 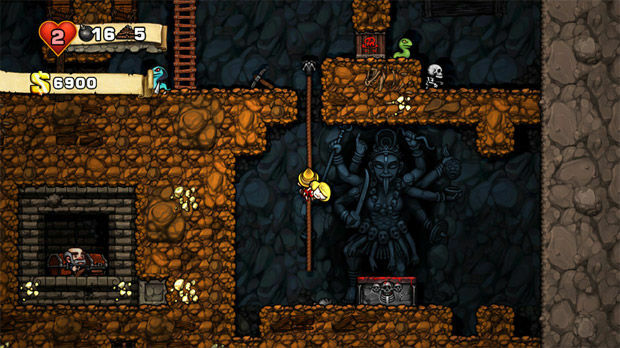 From there, Spelunky is absolutely unafraid of teaching you to pay attention to your surroundings. By playing recklessly, you run the risk of getting killed within a matter of seconds of starting up a round; there is a quick restart button for a reason. Don't let that scare you off, however -- this is a difficult game in the best possible way, with player deaths rarely ever feeling cheap or unwarranted. Occasionally, there will be a remarkable chain reaction of events you couldn't possibly have seen coming, but those often end up being hilarious, if nothing else. This is the type of game where the challenge doesn't lessen -- you simply get better over time. That said, levels will sometimes be dark (one of a selection of random events), essentially requiring you to carry around a torch to reach the end. With so many things out to get you, this type of level can be annoying to encounter. While level layouts may be generated randomly, more often than not, they feel hand crafted. Bits and pieces will begin to feel familiar over time as you become accustomed to the world around you and its rules, but you're always kept on your toes, lest you get shot by that just-hidden-enough arrow trap. It's the little details that come together so perfectly to create memorable moments. For instance, upon nabbing a Golden Idol, a large boulder will appear à la Raiders of the Lost Ark and utterly destroy everything in its path. It just so happens that, every so often, one of these boulders will come crashing into a shop, enraging its shotgun-wielding owner who then literally becomes convinced you are a terrorist. Chances are extremely high it will be this shopkeeper or one like him who ultimately kills you, possibly many levels later ... because they'll wait for you at ensuing level exits. And that's amazing. 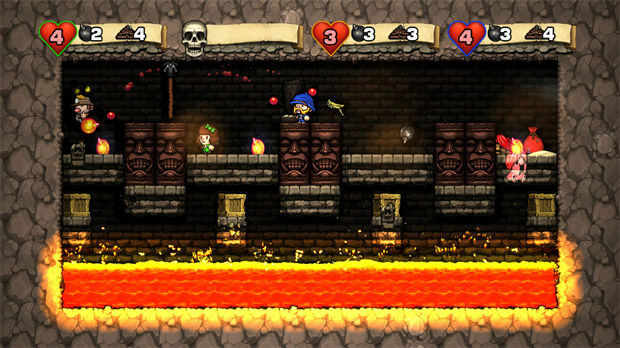 Spelunky's influences, which span multiple genres and mediums, aren't exactly subtle, but the end result is a game world that feels unique, not copied. It's particularly the kind of secret-filled backdrop those of you who have been gaming for decades will appreciate. I could have looked up on a wiki the fact that one out of countless tombstones will read "Ash," not "RIP," and signal a hard-to-get shotgun buried underneath. But I didn't, and my stumbling upon it with no prior knowledge other than being a fan of The Evil Dead brought a smile to my face. (Don't worry, there are plenty of other, far more interesting secrets that will go unspoiled.) 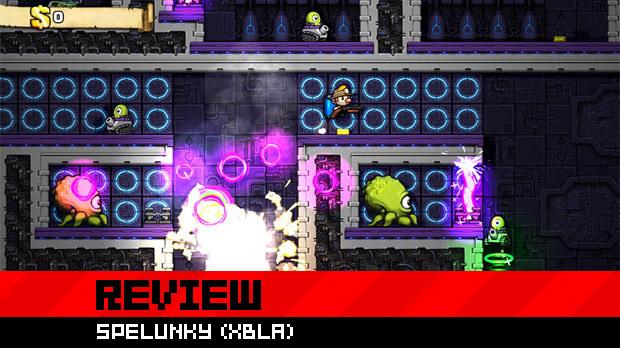 As some of the screenshots in this review suggest, it doesn't take very long at all for Spelunky to get weird. It's hard to tell exactly how much work went into adapting Spelunky for the Xbox 360 controller, but the controls feel wonderful. In fact, I don't have a single complaint. I'm similarly a fan of Derek Yu's new art style, which does away with charming pixel art for an aesthetic more fitting of an HD console. I have a feeling that the music, composed by Eirik Suhrke (Super Crate Box), will be the most divisive of all the big changes made in the move to Xbox Live Arcade. Which isn't to say he did a bad job -- far from it; check out the embedded video above, for example. It's just that George Buzinkai gave us some decidedly catchy songs for the original game. Personally, I really enjoy Suhrke's work and am of the opinion that, since the old game exists already, why not go all out for this new version? Simply put, both composers' soundtracks are entirely fitting for the two distinct art styles. At this point, you must be wondering about the game's new offline deathmatch mode. I was skeptical going in, but you know what? Not only does it not feel tacked on, it's great; there's nothing quite like it. You and three others (which can optionally be AI bots) are placed into a tiny room filled with items and hazards. From there, it usually only takes 15 seconds before everyone is dead, or one lucky soul has managed to somehow come out mostly unscathed. The bots deserve a special mention, because they bring an unrivaled level of chaos to this mode. You have no idea. They jump around the screen frantically while whipping, shooting, or bombing anything and everything that moves. I had intended to only play a handful of rounds but ended up playing deathmatch for hours, completely losing track of time. Although it's an odd comparison to make, if you're a fan of old-school Bomberman -- for me, Super Bomberman 2 -- you'll probably dig this. It's conceptually similar to that, only far more hectic. 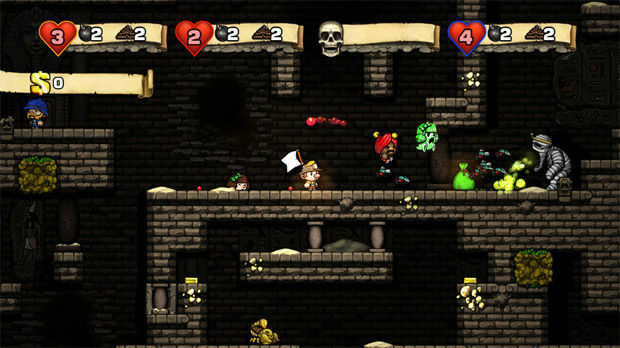 There is also now the option to play Spelunky cooperatively with up to three other players. Unfortunately, it is, again, local multiplayer only. What makes co-op so terrific here is that it completely changes the dynamic of the game. With more players to help, you don't need to be quite so cautious, and death isn't permanent. As such, people who don't frequently play games can still serve as good co-op buddies. Upon perishing, you assume control of a little ghost who can fly around and push enemies and items with a blast of air. That might not sound like much, but it prevents you from becoming bored and does actually contribute in a meaningful way. For instance, I love to distract shopkeepers while my buddies loot their stores. In single-player, stealing is incredibly risky and often fatal. Here, it's easier to reliably pull off a quick heist with the right teamwork. So long as one player makes it to the end of the level, you're golden. That surviving member will be able to find caskets on later levels which can be broken open to revive deceased players. 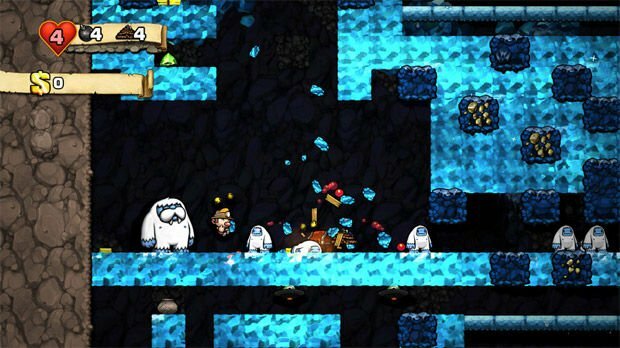 With the ability to inadvertently harm others, co-op in Spelunky could have been extremely frustrating, but it isn't. Instead, it greatly complements single-player, making the fact that it's not playable online a real shame. Some of you will have not needed to see this or any other review to know that Spelunky is well worth its $15 asking price. For everyone else, you owe it to yourself to, at the very least, go download the demo or even grab the original PC version to get a better understanding of what this game really is. All of the additions for Xbox Live Arcade -- most notably, new graphics and sound, competitive multiplayer, and cooperative play -- come together to flesh out what was already impressive in its earlier stages. To avoid Spelunky is to miss out on an incredibly satisfying, well-designed game.